The kitten was so tiny that she fitted in the palm of my hand. 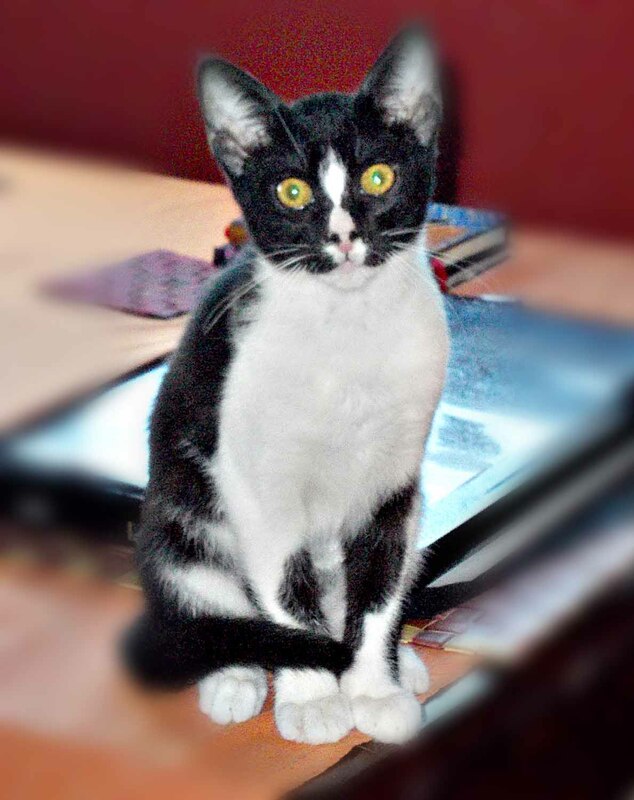 She was black and white, with perfect markings on her face, and her fur was still fluffy. At only five weeks old she should really have still been with her mother, but mum didn’t want to have anything to do with her kittens anymore. I would have expected her to be scared in our house, a completely new environment for her, but she wasn’t. She purred when I stroked her and was eager to explore her new home. Hamlet, only a few weeks old. I can do it! I CAN DO IT! I can stand still while you paint my portrait. I can! See! Not moved a whisker. Let me see! Despite the number of strays on Crete, luckily not all stories about the dogs and cats on this island end up having a tragic ending. Yes, most animals here aren’t neutered or spayed and yes, people do like to pass the problem onto somebody else. There’s many a litter of puppies and kittens left at the door of animal loving foreigners. In fact, in the fourteen years that I’ve lived here, I’ve adopted a total of nine dogs and seventeen cats, most of which have appeared at my home. There does come a point however, when you have to say that enough’s enough. That point came to us a few years ago when we realised that our bank balance was dwindling away to nothing. Food and vets bills for the seven dogs and five cats which we still had at that time were steep and we naturally wanted to give the animals we had, proper vet care and enough food. However (yes, there is a ‘but’ here!!) last year I started thinking that it would be nice for Macbeth, the only indoor cat we own, to have a companion. Macbeth had been the last cat we had adopted and I had decided to keep him inside as we were losing too many cats at a young age when they went outdoors. Macbeth had been feral when we took him in as a small kitten eight years ago and it took me about a month to tame him. After that he remained a little edgy and anxious, except with us, and it took a while before he started feeling comfortable with other people. He has always seemed content staying indoors and enjoys looking out of the window watching the birds. He loves to spend time with the other cats, but in the summer they go outdoors so he is left without feline company. However, I didn’t want just any old cat to be the new member of our family. I had a specific idea what Macbeth’s playmate would look like. I wanted a black and white cat which was more black than white. In addition, I also wanted a kitten, not a fully grown cat as I’ve always found it easier to introduce a kitten into my cat family. By this time we were down to three cats, Macbeth of course, who is a very handsome black cat, Raffles, a ginger cat, who has beaten all the odds and survived to the grand old age of sixteen, and Mouse, a ten year old female, mainly white, but with a black tail and a black patch over one of her eyes. 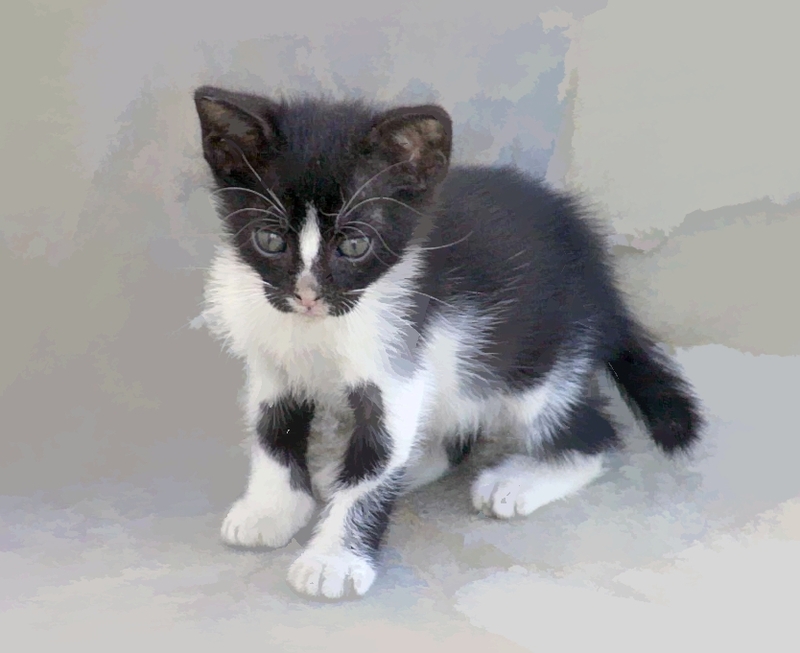 I didn’t think that what I was asking for was a lot, but would you believe that I had been looking for a black and white kitten for months and hadn’t had any luck? You would think that in this country with the number of animals needing homes, it wouldn’t be that difficult, but it was. There seemed to be every colour except what I wanted. I had almost given up hope when one day last August, a friend of ours said that somebody in Kalives was advertising kittens needing homes. I tried not to get too excited in case there wasn’t one that would suit. Peter, my husband, wasn’t too keen on getting another pet, but I did persuade him to call. After all, it was only one little kitten! Imagine my excitement when I heard there was a black and white one in the litter! Peter went by himself to look at the kittens, knowing I would probably want more if I went and we both knew we couldn’t really afford it. I was very excited when Peter went to pick her up, but I did expect the new kitten to be nervous as she was so young. She’d had some human contact with Stephen so I hoped she wouldn’t be like Macbeth had been when he arrived. My first encounter with him had been this tiny black ball of fur hissing and spitting at me. Peter brought Hamlet into the sitting room (which is upstairs in our house) in a cat carrier. As soon as he came in, the room resonated with meows. When I opened the carrier, I saw her immediately. She wasn’t cowering in the back, but she wanted to get out and see what was going on in her new world. She was inquisitive from the word go and she still is interested in everything we do. It didn’t take me many minutes to realise that despite only being five weeks old, she had no fear. She might have been small, but that didn’t stop her from nosing into everything. I believe she decided straight away that she was at home and that she liked it. We thought she was a boy at first and I had already decided to call her Hamlet. We only discovered that ‘he’ was a ‘she’ many weeks later and by that time the name had stuck. She is such a little tomboy that it didn’t seem to matter, and anyway, she usually gets called Hammie. The reaction of the other cats wasn’t quite what we hoped it would be. Macbeth, her new best friend, ran and hid! He was curious however, and kept coming out for a quick peek at her, but he didn’t know how to react. He had never seen a kitten in all the time he had lived with us, so that might have had something to do with it. The other two cats had been used to the comings and unfortunately, the goings of cats for many years. Raffles ignored her completely and even now doesn’t want much to do with her. She is however, determined to get him to play and will unceasingly jump on top of the poor old cat in the hope of an extra game or two. We always know when she is attacking him by the very loud meows and hissing coming from Raffles and we do have to go and help him. He is in his latter years and wants a quiet life after all. Mouse doesn’t come indoors that often in the heat of the summer so it took her a few days to realise that there was a new member of the family. She hissed when she first saw her and left it at that. Strangely enough, Hamlet has never tried to play with Mouse. Mouse will give her a hiss if she comes too close and Hammie seems to give her a bit more respect. 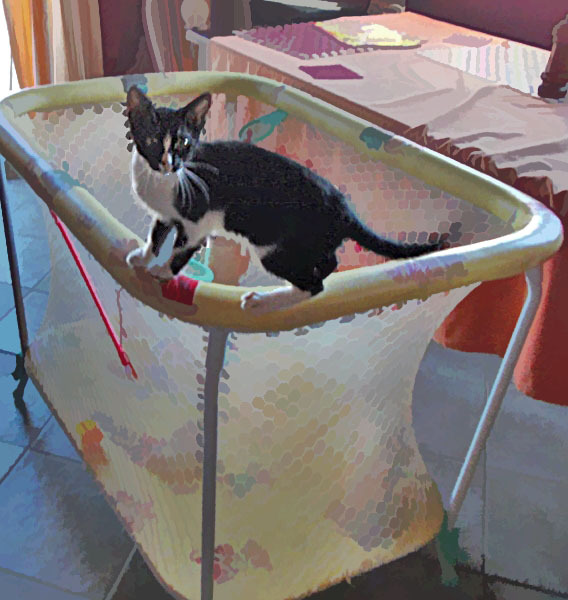 I had a playpen which we had used for a litter of kittens many years ago, so I set that up and put Hamlet in. We thought it was better for her to be in there for a while in case the other cats tried to attack her. However, later in the evening I put it next to the settee where I was sitting and she managed to climb right out of the playpen and onto my lap! You got to be jokin. As if this is going to hold me. Then came the problem of where to put her at night and while we were out. We didn’t trust the other cats with her yet, so we decided that for the first few weeks, while she was so small, and until the other cats got used to her, she would sleep in the dining room. She was fearless, even at that age, and would march right up to them, but they were so much bigger and stronger than her and we weren’t sure what would happen if they were left alone. As time went on, Macbeth stopped hiding and started playing with Hamlet. It was a delight to watch as Macbeth had never really played before. As a kitten, I had managed to entice him with one toy, a mouse dangling on the end of some string, but that’s where the playing stopped. The other cats were way past their playful stage when he was a kitten so he had nobody to teach him. From the first day she arrived, Hamlet wanted to play with everything; balls, little teddy bears, mice on the end of string, corks, you name it! Once Macbeth had come out of hiding and had got used to the new arrival, he started to watch Hammie play. Then he started playing himself. Hammie even taught him how to use the scratching post; unfortunately a little too late for the two chairs of ours that Macbeth had ruined! Hamlet at two months old. Great blanket. What! No you cannot have it back. Sometimes the two cats would have play fights and you would wonder whether or not to stop them, but Macbeth always seemed to know when to finish before really hurting Hamlet. We always kept an eye on them to make sure, although now that Hammie’s bigger we just let them get on with it. Hamlet developed a great interest in water very early on, in particular running taps. If she hears a tap running, she will dash over to it immediately. She goes crazy over the water pouring out, moving her paw into the water, trying to catch it. I have a shower attachment fitted to my bath and stand over the bath to wash my hair. Hammie usually comes in and stands on the ledge of the bath, usually where I am, watching the water coming out of the shower head. She is absolutely fascinated by it. Unfortunately, when Hamlet was about ten weeks old, we had a health scare. One morning when I got up, I found her unusually quiet. In fact she was fast asleep. Usually she would be waiting impatiently for me to come upstairs. I went over to stroke her, but all she did was move a little. I felt her head and it was very hot. I knew something was wrong and of course, I was worried. I wondered what could have happened to make her like this overnight. The only option was to take her to the vet. I couldn’t believe that I might be losing this little ball of energy that had recently come to our home and taken over our hearts. Luckily however, Hamlet’s days weren’t numbered. She had an infection and had to be given antibiotics for thirty days. They were in liquid form and the first couple of days were easy as she was so lethargic, but then she started to recuperate and boy, did she struggle. It took two of us to administer the antibiotic! The vet said that the infection had been caused by fleas. Being too young to have the ‘spot-on’ treatment, we had bought the flea spray, which again was a struggle to get on her, but we managed to give her a good spray every now and then. The fleas seemed to disappear, but came back too quickly. The vet said you had to completely drench the kitten in the spray. That would not have gone down at all well and it was with great relief that by the time she had finished the antibiotics, she was old enough to have a ‘spot on’ treatment. Hamlet now five months old. I’ve been practicing this look for weeks. Now to see if it works. Look into my eyes! Hamlet continues to thrive. She is still very inquisitive, always wanting to nose into everything and always interested in what I’m doing. She has a taste for human food that I’ve never seen in a cat before and she is always trying to steal some. She eats crumbs of toast and cake and if I have toast and marmite and leave a bit of crust with the marmite on, she will eat that. She will lick dishes if they have had egg or ice cream in them and she has stolen bits of cheese. I have to keep an eye on her all the time to make sure she doesn’t eat anything that is toxic for cats. She does like cat food as well and knows where hers is. She has sachets which come in a box and she will go and try to get one out when she’s hungry. She hasn’t got the knack of opening one yet though. When Hamlet reached six months, she found a new trick and that was jumping on our shoulders. She has even done this when I’ve been washing my hair! Hammie still fights with Macbeth and their bouts can be quite rough. Raffles still doesn’t like her much as she tries to fight with him, but he’ll sleep happily by her if she does the same. Mouse will sleep next to her as well, but that is as far as their relationship goes. Hamlet loves to rub noses with us and to have lots of cuddles. She enjoys looking out of the window with Macbeth at all the birds and indoors she loves catching flies which have somehow got in. She and Macbeth have become the best of friends which was the plan in the beginning, but plans with animals don’t always turn out as you hoped! 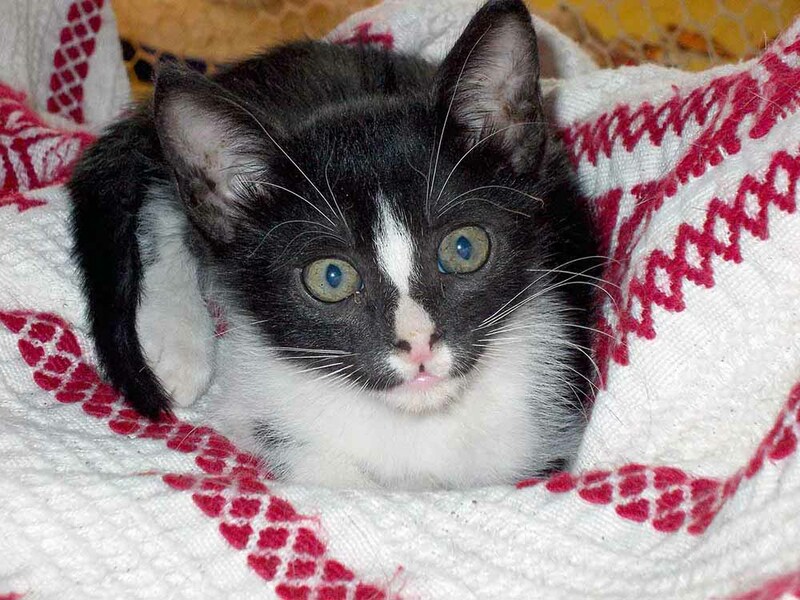 To sum up, Hamlet is a happy, playful and mischievous cat and is a joy to have around. I’m so glad that we brought her into our home. It’s just a pity that there are so many cats needing homes on this island and not enough people to give them that love and care. Note: Images of Hamlet also appear in the, B-Life In The Wild and C-Growing Up pages, before he was given his new home.